Not only are the people who work there unusually friendly and knowledgable, the pastries, soups and empanadas are fantastic. I especially like the mini-soup/empanada or soup/sandwich lunch special..Serious bang for the buck- and it feels a little bit like one of those treasures that only a few know about. I LOVE the cucumber/dill yogurt soup and a lemonade for lunch on a hot day. 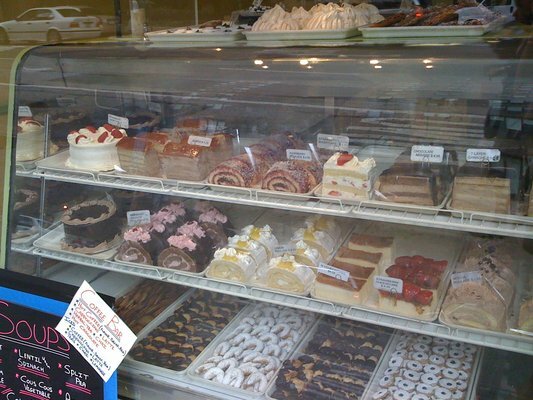 If you need a little something sweet after, you really can’t go wrong with any of the delicious cookies or cakes. The only tiny negative is that the empanadas get heated up in the microwave..They are much better if you get one to go and heat it up in your oven. Great little neighborhood spot. >…and their rainbow cakes are pretty excellent….